The first and foremost impressive aspects are the design and build quality of the speaker. The main body is constructed using an aluminium alloy whereas the circular base is made of polycarbonate material. The round-shaped metal casing is neatly polished and feels smooth, thereby giving the speaker a solid and premium look altogether. The speaker grille at the top blends well with the curved edges that also makes for great ergonomics. 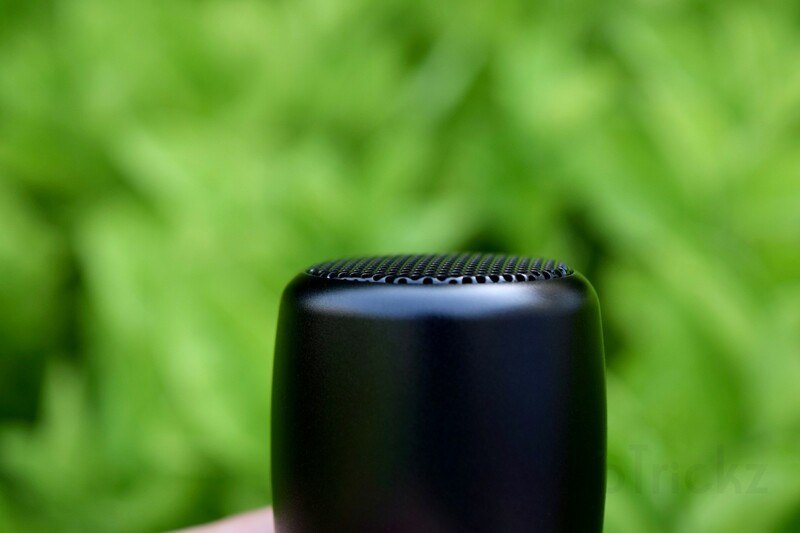 At the bottom side, there is a micro USB port for charging and an opening for carrying cord that allows users to attach it to a bike or their backpack while hiking. The base holds the multifunction button, LED light and microphone in place. An anti-slip rubber band at the base further prevents the speaker from wobbling or vibrating when placed on slippery surfaces. Speaking of the size, this is the most compact and lightweight speaker we’ve come across after having owned half a dozen of such devices. 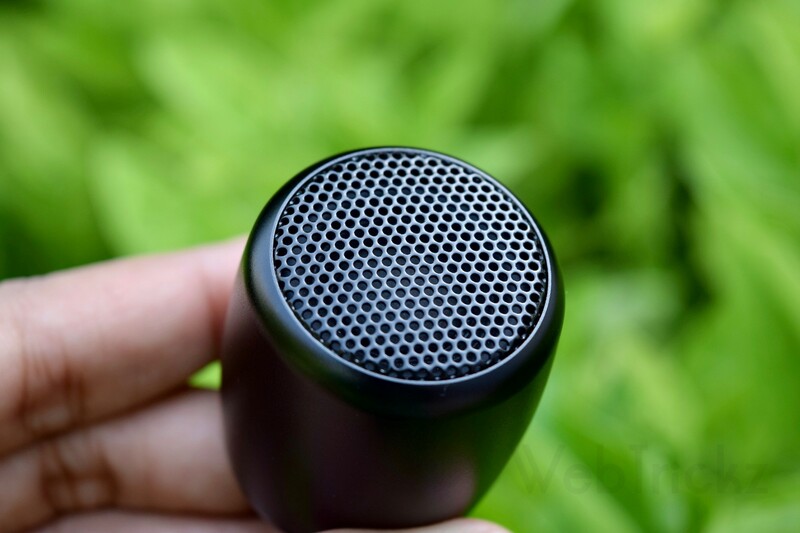 With dimensions of 42.1 x 36.7mm and weighing a mere 45g, this is an incredibly tiny speaker similar to the size of a walnut that can fit easily in a trouser or jacket pocket. Moreover, it’s small enough to fit in the palm of your hand and is very comfortable to hold. Overall, the design looks premium and pocket-friendly. Comes in Black and White colors. 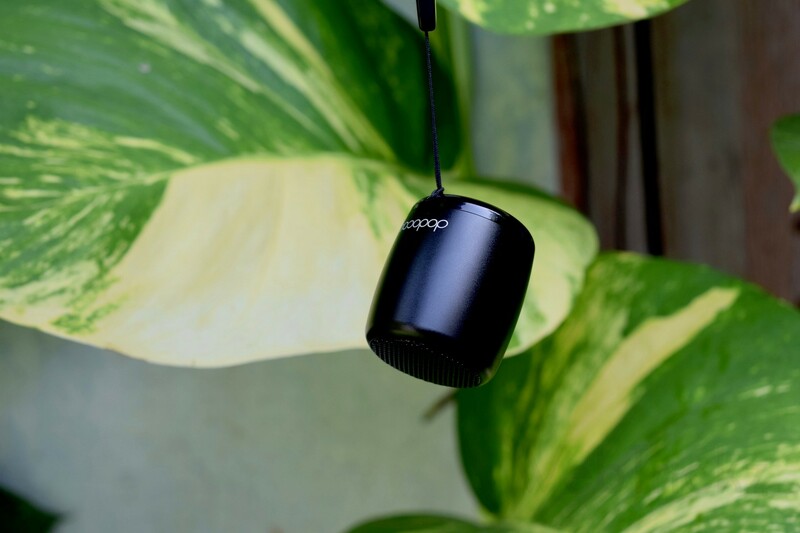 Featuring Bluetooth connectivity, this speaker can be wirelessly connected with most compatible smartphones, tablets, and laptops. Perhaps, due to its extremely compact form-factor, the device misses out on volume control buttons, 3.5mm audio jack (Aux in) and microSD card support which is acceptable. 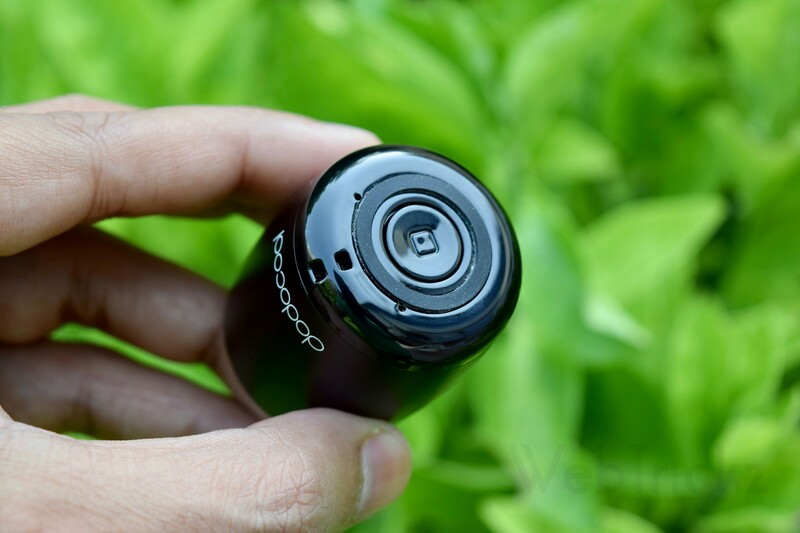 Besides offering music playback, the built-in microphone allows users to answer incoming calls while the power button doubles as a camera remote shutter to take photos and turn the volume up. To save power, the speaker turns off automatically after 5 minutes when not in use. Pairing the device is easy but for some reason, the speaker is detected as a keyboard that conflicts with the virtual keyboard and hence we were unable to use the keyboard on phone. 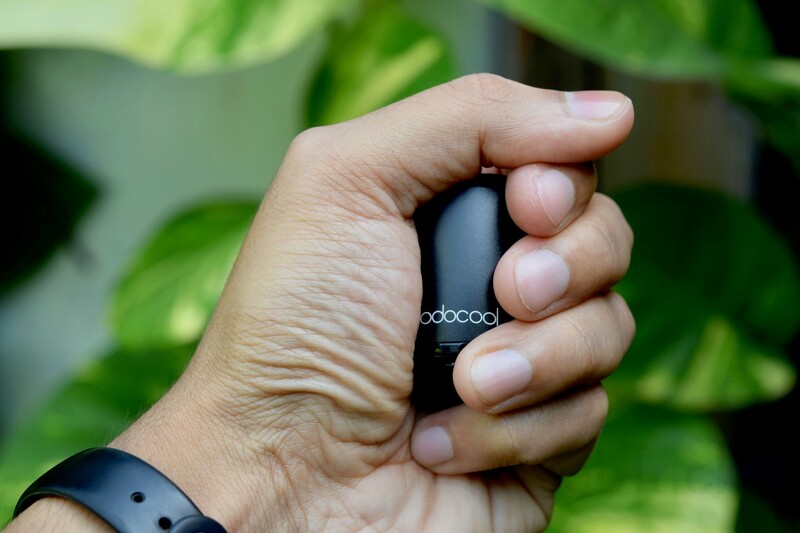 Though dodocool claims 33ft transmission range, we found the connection to be bit poor and unstable when there was a certain distance between the paired devices. What’s interesting is that it automatically connects to the last connected device but you can’t connect two devices simultaneously. After getting surprised by it smaller than an egg size, we were simply blown away by the sound output of this tiny device that packs a 3W speaker. Undoubtedly, the speaker is surprisingly loud and produces an amazing sound quality given its small size and low price tag. The loudness doesn’t affect the sound quality which was clear and powerful with a decent level of bass. Also, we didn’t notice any audio distortion even at the maximum volume which is great. That said, it capable of filling a 200 sq ft. room that comes handy when planning small in-house parties and watching movies on a smartphone or tablet. Packing a 300mAh rechargeable Li-Polymer battery, the speaker managed to play music continuously for almost 3 hours in our test. The standard micro USB port lets you charge it easily using an Android phone charger and it takes about 2 hours to fully charge. The LED indicator at the bottom turns red while charging and turns off when the speaker is completely charged. The device also notifies with a warning tone when the speaker is running low on power. 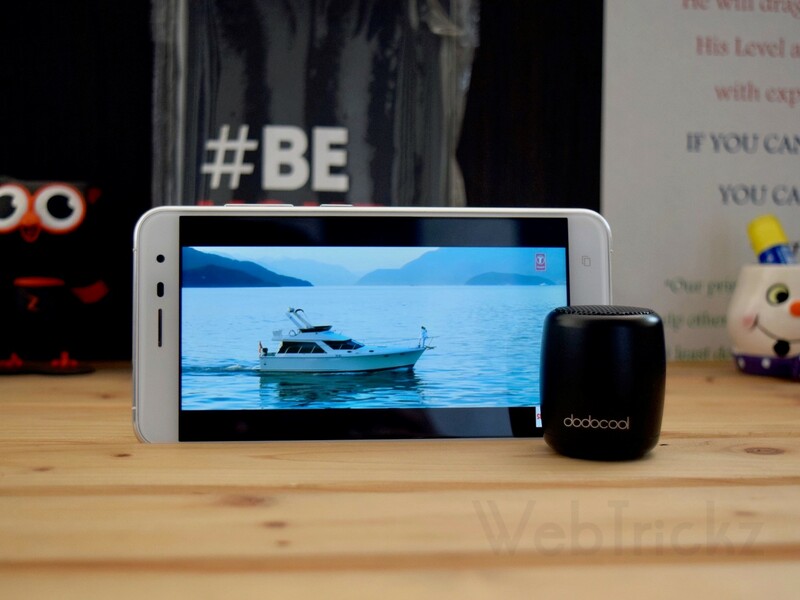 Summing up, one shouldn’t judge the performance of this speaker by its super small size. 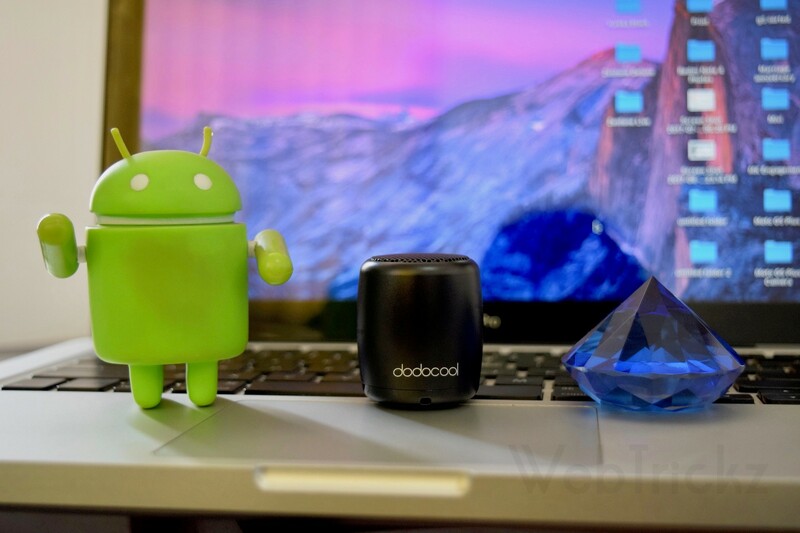 The speaker packs a punch considering its size and makes a great addition to one’s gadget accessories. Except for few downsides, it’s a solid performer that produces rich and superior quality sound which is usually unexpected from devices with such a toned down size. In a nutshell, it is an exceptional speaker and a solid buy for those looking for a super portable yet a powerful speaker in a limited budget. 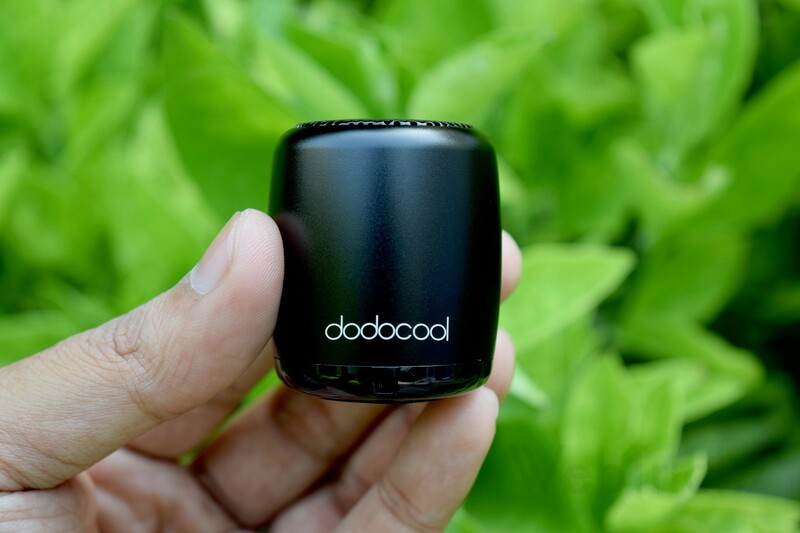 Those interested can purchase dodocool DA84 mini wireless Bluetooth speaker for $12.99 at Amazon. Yep, same keyboard trouble pairing with Xiaomi RMN3P. Other mobile devices have option to keep virtual keyboard when it detects one physical.